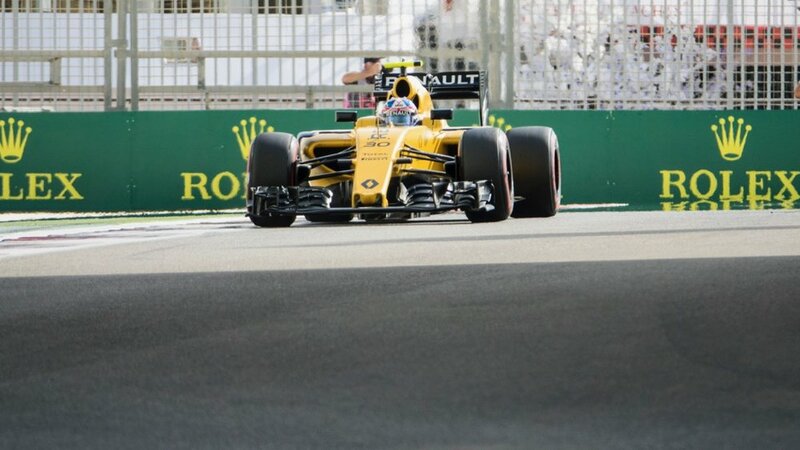 Saturday was Qualifying for the Abu Dhabi Grand Prix! We decided to split the day between sight seeing and the race, so we had a bit of a later start. 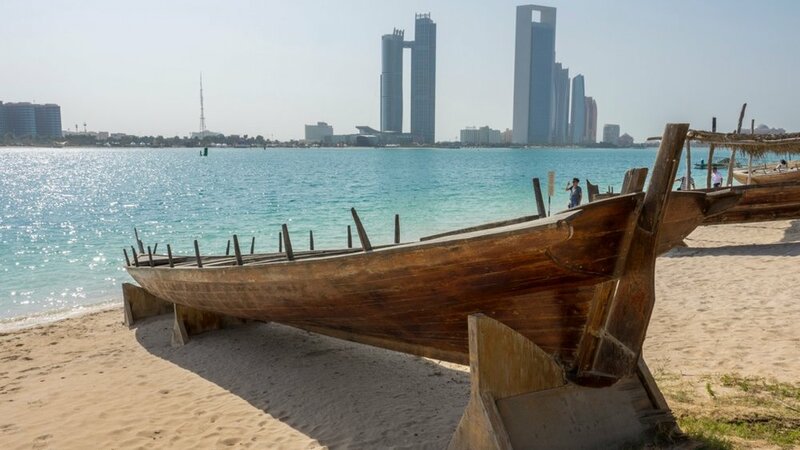 We stopped by the Abu Dhabi Heritage Village and walked along the sea-front Corniche before taking a taxi to the Circuit. We walked the race track during the first qualifying session, enjoyed an air show by the UAE Air Force and finally watched as Lewis Hamilton took pole position for Sunday's race! Yesterday was a long day at the race venue, so we decided to switch things up a bit today. Rather than another long day at the race, we decided to try and see a bit of the city before heading over. We were up at a reasonable hour, and wandered over to Tim Horton's for breakfast again. Then we popped into the mall next door to pick up a memory card - mine was almost full. From there, we hopped in a taxi and took it out to the Abu Dhabi Heritage Village on the other side of downtown. 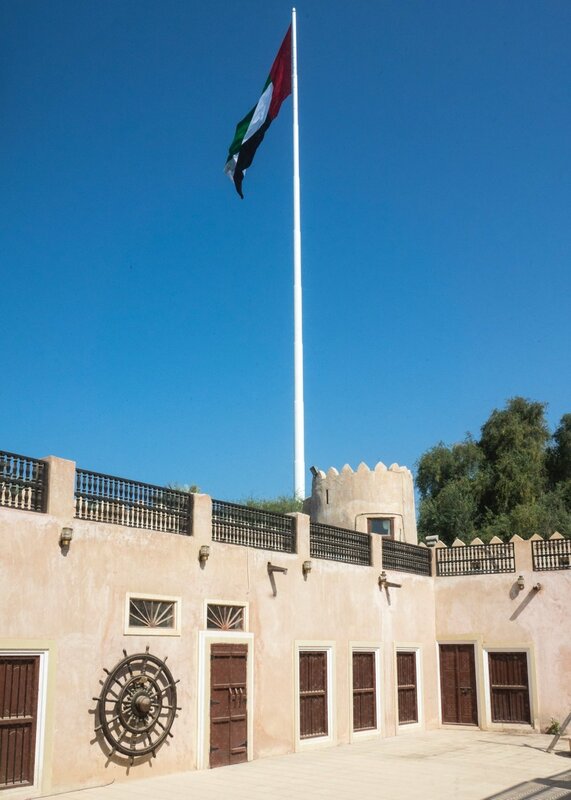 The front entrance to the UAE Heritage Village. The Heritage Village was supposed to be a recreation of the traditional way of life in the area. But instead it ended up being a badly put together tourist attraction. Thankfully it was free to get in, as it was pretty bad. We spent the minimum time in the place, then decided to walk back towards the Emirates Palace, the next place we wanted to check out. Inside the Heritage Village. This building has individual rooms with craftsmen showing different traditional activities - waeving, metalsmiths, glass blowing and such. The museum had an odd collection of different items. This was the tallest flagpole in the world for quite some time. A date palm, full of fruit. There was a great view back to the Abu Dhabi skyline. It's not as interesting as Dubai, but still quite impressive. There were a series of traditional boats along the shore that we could check out. 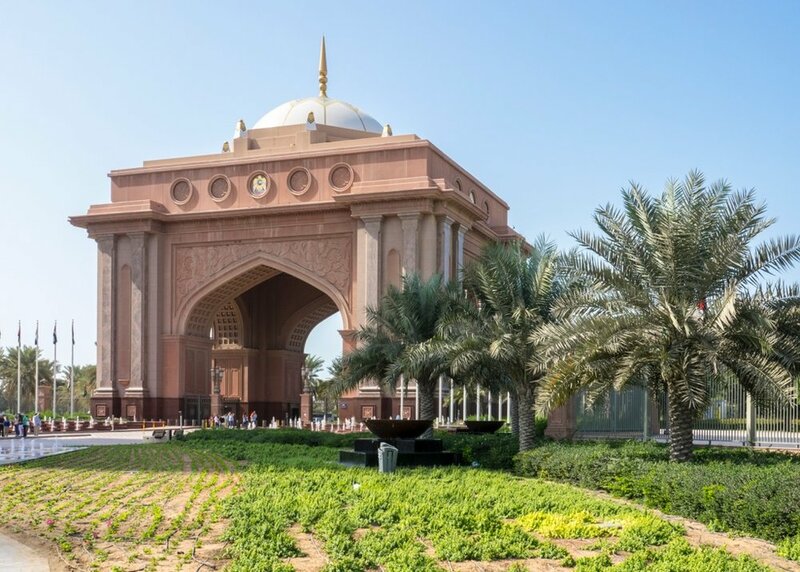 Emirates Palace is supposed to be the most expensive hotel ever built at $6B. Yeah, with a "B". But we didn't make it. The hotel is on a little peninsula, and you can't walk out to it. We might try again later. Turns out there are only certain days of the week that the public can go into the hotel, and today wasn't one of them. Emirates Palace, as seen from a distance. We're not sure, but think that this is more of the Emirates Palace. This mosque has some pretty prime beach front. You can see through the front gate, up to the main building of the hotel. One of the many amazing buildings that make up the Abu Dhabi skyline. The other thing we wanted to check out was the beach-front Corniche, a walkway and series of beaches that were supposed to be very nice. They were, but most everything was still closed up, so I think our timing was off. 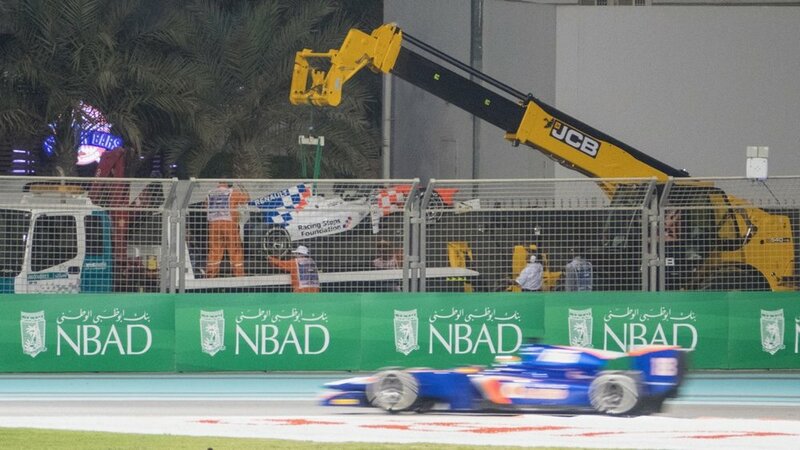 We were a little discouraged by this, so we hopped in a taxi and headed out to Yas Island and the Yas Marina Circuit to check out more racing action! The view from the public beach along the Corniche, out to where we were near the Heritage Village. Now that we knew where we were going, we had the taxi drop us off at the Marina. We had decided to watch the last practice session from track side. We had found a couple of good places to watch from to get some different views of the cars and the track. Justine's favorite - the pool was now full! Lewis Hamilton, from the bridge by the crazy hotel. A Ferrari coming right at you! A Mercedes heading under the hotel bridge. 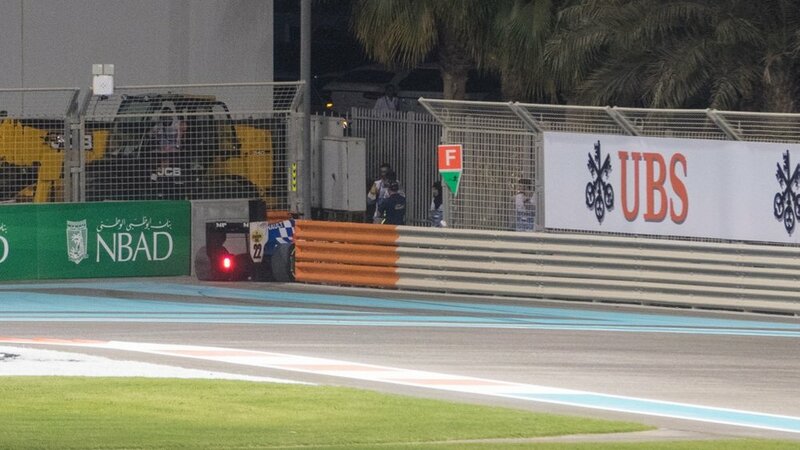 So we walked through the Marina and over to the Yas Viceroy Hotel, and watched from there. The we slowly made our way back along the race course, watching the session from a couple of different spots. Hopefully some of the pics turn out. Close up of Ferrari World. The practice session was ending as we got back towards our seats. We stopped at one of the snack bars (inside in the AC) and had some lunch, before heading up to our seats. 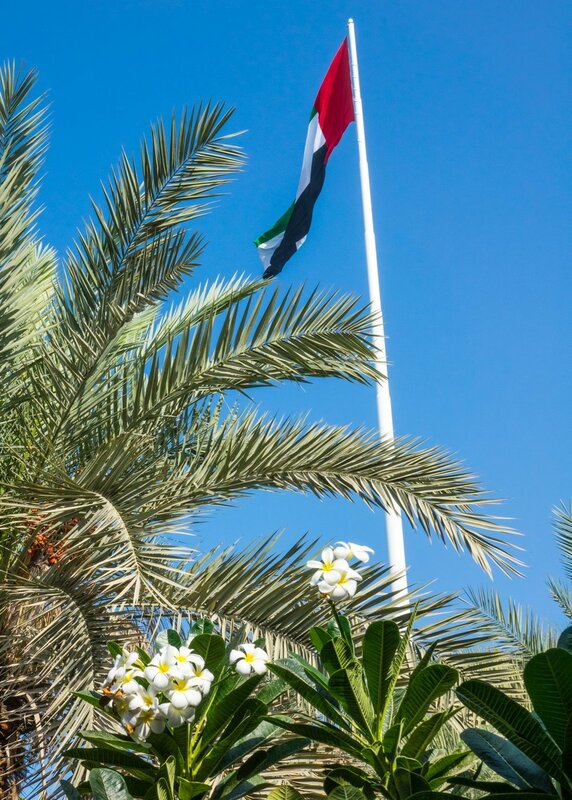 The schedule suggested there was going to be something of an air show, and we were delighted to see the seven planes of the Al Fursan aerobatics demonstration team from the UAE Air Force. They did an amazing aerial display over the race course that lasted a good 20 minutes or so. It was pretty cool. I've never see an airshow with quite this much smoke. The airshow display, over the race course. Not long after the air show ended, it was time for qualifying! For whatever reason I haven't covered the state of the Formula 1 season. Justine and I have been Mercedes and Lewis Hamilton fans, and the race in Abu Dhabi is the last race of the season. Hamilton is second in the drivers standings, 12 points behind his teammate Nico Rosberg. Hamilton needs to win this race, and have Rosberg finish 4th or lower to win the title. Given that Hamilton and Rosberg have dominated most of the races this season, that seemed unlikely. So we needed Hamilton to win the qualifying session, and take the pole for the race on Sunday. 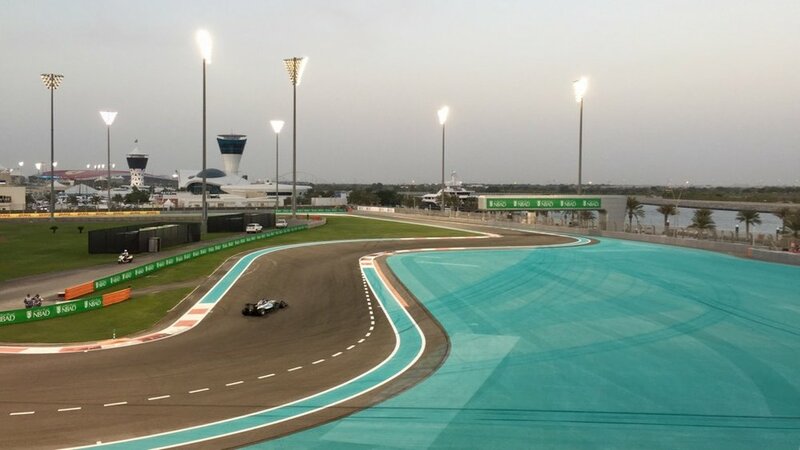 The lights came on, and the sun went down as we started qualifying for the Abu Dhabi Grand Prix! Most of the time cars were very much on their own. Every once in a while a couple would come through together. A Williams kicking up sparks. A Ferrari, making the turn right in front of us. 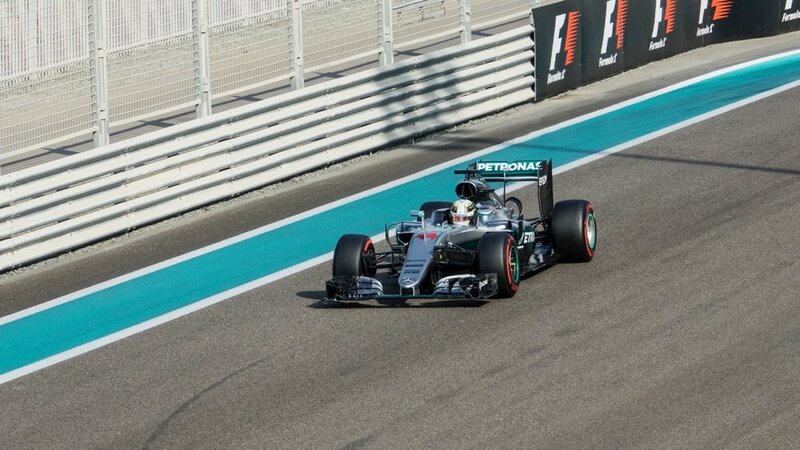 At the end of Q1 Hamilton had set the fastest time! The rich folk at the Viceroy had a great view fomr their balcony. Justine's party boat was starting to fill up. A couple more cars pushing the pace into Q2. 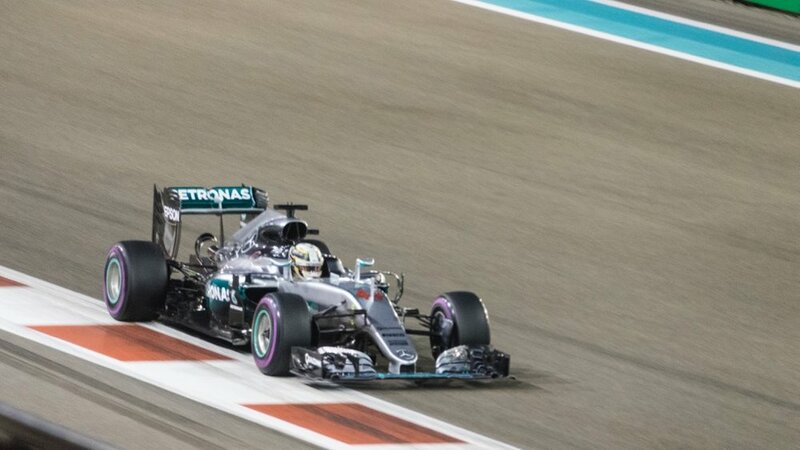 Lewis Hamilton - fastest man on the circuit. Qualifying last about an hour, and each of the drivers tries to set the fastest time possible. There are 22 drivers to start, and they eliminate the slowest six. Then the 16 remaining go again in Q2, and again they eliminate the slowest 6. 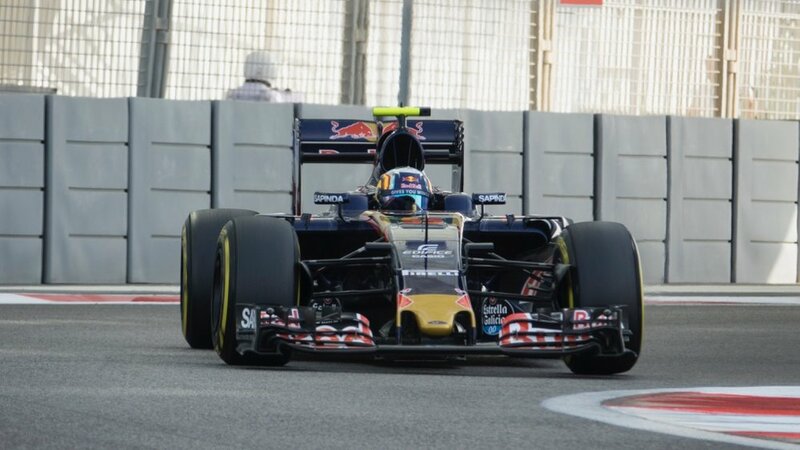 Then the last 10 drivers set lap times in Q3 for the top 10 places on the starting grid. Everything went according to plan, and Hamilton set the fastest timin in each of the 3 sessions, and secured the pole positon. Sadly, Rosberg was second and no one else was really close, so it looks like something dramatic will need to happen on Sunday for Hamilton to win the drivers championship. They started the light show on the Viceroy during the qualifying session - pretty amazing. The grandstands finally started to fill up. 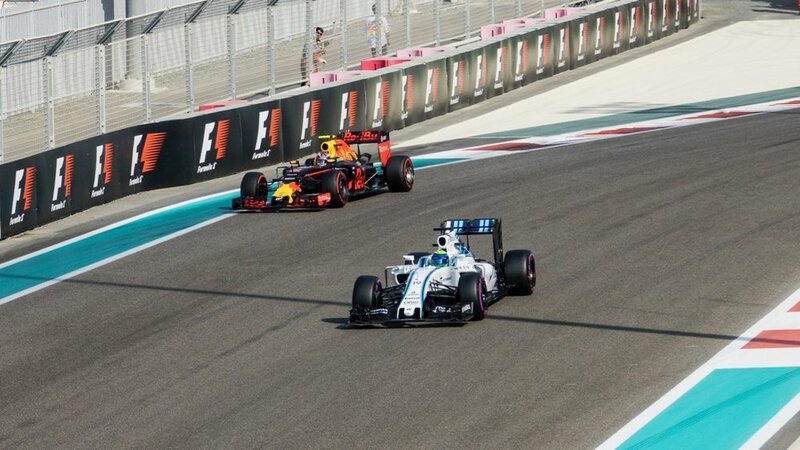 At the end of Q3 Hamilton was still the fastest man on the grid and had secured the poll for the race! After the qualifying sessions, we stayed and watched the GP2 race. It was pretty fun, although short race (only 31 laps). The light son the Viceroy Hotel. The GP2 race was pretty exciting - lots of cars close together throughout the whole race. The was lots of action right out in front of us as well. Unfortunately for him, it ended up being a serious problem and he had to stop, and drive off the track. Which ended his night, with a car on the back of a truck. After the race, we headed over to the concert to see Lionel Richie. Surprisingly, the crowds for Lionel Richie were bigger than for the Chemical Brothers. We grabbed a bit of food once we were inside, and waited for the show to start. Thankfully there was no opening act, and he started just after 9:00. The craziness getting into the show. We watched the first hour of the show, then got a taxi back to the hotel. Another fun day! Our hotel in Abu Dhabi.